This essay appeared in Citywire Selector on March 7, 2016. Multi-asset funds are a double-edged sword for professional fund investors. Their flexibility and lack of constraints offer the full potential of truly active management. Skilled managers are able to deploy their best thinking in a wide-ranging and flexible manner across volatile markets. Without skill there is the potential for big disappointments. All the while, high levels of manager flexibility make many multi-asset funds less predictable. The less like an index a fund is, the greater potential for a mismatch of expectations. Replace the index with a targeted ‘outcome’ and things get tricky fast. That sword cuts both ways. Predicting how a multi-asset (or more broadly, any fund with a high ‘degree of investment freedom’) may be positioned in the future is impossible without proper transparency and the right tools. The rear-view mirror approach to analysis can be particularly deceptive and dangerous when it comes to multi-asset. Many professional fund investors have been wary of incorporating flexible multi-asset funds into their portfolios. Without the right framework in place to understand and ultimately control the overall portfolio allocation, too much is left to the imagination and hope. Will the fund take positions in emerging or developed markets, equity or credit, what will be the duration of the fixed income exposure? How will this change over time and in different market cycles? This is particularly important when multiple highly flexible funds are used in a single portfolio. A ‘good’ idea may be duplicated multiple times leading to unintended concentration risks. Unlike basic building block funds, the shifting portfolio level exposures of multi-asset funds shape the overall strategic asset allocation set by intermediary buyers in often unforeseeable ways. As more of these funds are incorporated into portfolios, there is a greater level of complexity and challenge for investors. While for years professional fund investors have been engaged in an already complex game of chess, a third dimension has been added to the game. Professional fund investors need to consider how a highly flexible, unconstrained manager may use her range of investment freedom to position a fund into the future. As the shape of the fund changes, so too does its return potential and risk profile. Matching this shape with both other funds used in a broader portfolio context and end-investors own particular needs is essential. Fund investors need to consider the future potential of a fund’s positioning and risk taking. I call this a ‘degrees of investment freedom’ framework. It takes into account the breadth of instruments and techniques a portfolio manager has at his or her discretion and the manager’s flexibility to use them. It may be thought of as a measurement of a manager’s decision-making and implementation bandwidth. The less constraints, the higher the degree of investment freedom the manager has. The chart above compares the footprints or ‘maps’ of two top selling cross-border multi-asset funds. Measured along each of the axes is a cure component of the overall fund strategy through which a manager can express a market view, take risk and produce a return. One might consider these components as being the ‘tools’ available to a manager to generate the desired outcome. Each component is ranked on a scale of 1-10. A score of ‘1’ indicates that the exposure range is ‘static’ while ‘10’ indicates it is exceptionally dynamic. While the two funds illustrated are in the same category, it is clear by mapping them according to the degrees of investment freedom framework that there are substantial differences in the manager’s respective approaches. For instance, over the period observed, the manager of Fund A has been highly dynamic in the shifting of the duration while the manager of Fund B has been exceptionally active in the management of sector exposures. The benchmark, here a common fixed income index, represents ‘static’ exposures to each of the components. Investors should expect something in return for allotting an increased degree of freedom to managers. Dolling out more decisions and increased discretion to managers is both an investment and operational risk which must be monitored and potentially mitigated, so investors want to be rewarded for these risks. Managers who have full freedom to invest across the entire credit spectrum for instance should be expected to perform better in periods of market volatility and should have the opportunity to earn a higher fee for it. At the same time, the more freedom a manager has to manage risks and implement their investment ideas, the fewer acceptable excuses there will be when such goals are not met. A high degree of investment freedom also represent a higher level of ‘trust’ on the part of investors. The more willing an investor is to turn over asset allocation decision-making, the less control they have over the investment manager. 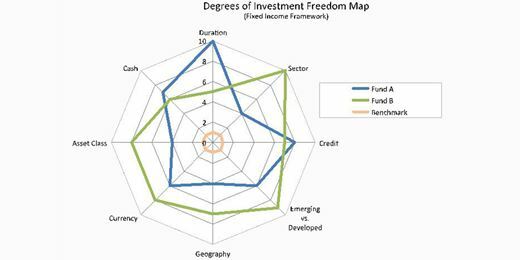 Further, in using funds with a high degree of investment freedom, intermediaries become more dependent on the manager in determining the end-investors’ overall investment ‘experience.’ This is a central hesitation of intermediaries in thinking about allocating to highly flexible strategies. As the split between active and passive implementation grows, active managers are expected to demonstrate their skills and strength of their investment conviction. Considered in broad terms, the evolving nature of the industry may be considered as a trend from a bounded to an increasingly unbounded environment for managers. More tools and techniques are enabling managers to produce results in a broader range of market scenarios and with specifically defined goals. It is crucial to understand the dimensions of that freedom.